Lely is happy to announce that production of the Lely Astronaut A5 automated milking systems in North America and globally is more efficient than ever. Implementing the five ‘S’ (5S) principles of lean manufacturing has allowed for a more than adequate production capacity to meet the expectations of our customers, resulting in record numbers of A5’s being produced each week worldwide. Being able to adjust production to meet demand has resulted in Lely being able to offer customer satisfaction that is unrivaled. A new Lely customer recently discovered just how well Lely’s production can adjust due to dairy farmer needs. 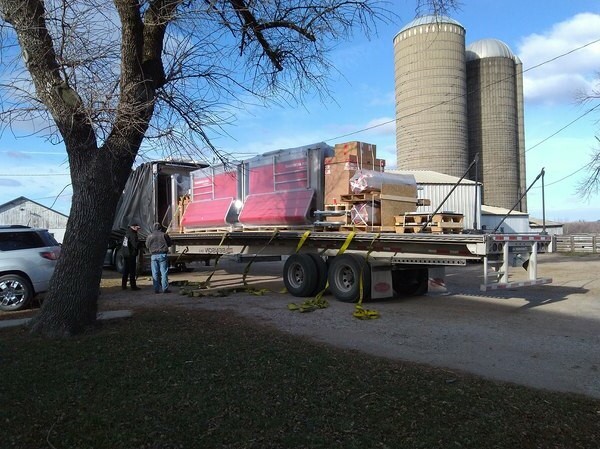 In this circumstance, the customer needed the robots quickly and just six weeks after the time of their purchase, Lely delivered. “We realize things change at the farm level and do our best to adjust and be responsive to meet the demands of the marketplace. Great communication, an awesome team of people along with standard operating procedures enable us to alter the game plan as needed,” states Ryan McFarland, Lely North America operations manager. Lely product availability has never been greater and much of that success has come at the hands of lean manufacturing. In order to be a more responsive supplier to our customers and Lely Centers, Lely produces under the 5S principles of lean manufacturing. Those five principles are sort, set in order, shine, standardize and sustain. You may be wondering how those relate to the manufacturing process? Let’s take a look. Sort – this is the process of determining what is necessary and removing what is unnecessary from the manufacturing area. Set in order – orderly storage is important in manufacturing so valuable time is not wasted searching for items that should be readily available. Shine – a clean environment is vital to the manufacturing process so if there is a problem it can be easily identified (leaks, spills, damage, etc.). Standardize – setting up standard operating procedures so there is no hiccup to production if a member of the team is absent or if there is someone new to the process. The 5S methodology was developed by a Toyota engineer after World War II. It aims to relentlessly remove waste from processes, provide just-in-time inventory, add value, organize workspaces and ultimately create employee pride. 2018 was a big year in robotic milking as Lely launched the Lely Astronaut A5. Named “The New Milestone in Milking,” the A5 continues to reach new “milestones” each day in terms of sales volumes and units installed/running all over the world. As many customers are now experiencing, the A5 delivers on the features of reliability, cost of ownership, up-time and ease of use with new innovations such as the hybrid arm, TDSII, user interface and new milk transport and vacuum systems. “As we wrap-up the first quarter of the year, 2019 kicked off with challenging weather across the nation, but our supply chain and carriers didn’t miss a beat. We are very excited for this year and aim to roll out the robots to deliver on promises as best possible,” adds McFarland.